THE PARIS EFFECT is now available. Order Here! HOW WOULD YOU SPEND 7 DAYS IN PARIS? Mia's Custom Paris Travel doesn't begin to describe the pains she takes to deliver the ultimate dream vacation in the city of light. She offers her clients a front row seat for their very own custom trip guaranteed to deliver a fun, life changing holiday. Follow Tooty, Susanne, Justine & Ruth as each gets a warm welcome and a Paris hug that only Mia can deliver. Tooty - fitness fanatic, she doesn't want to gain an ounce in delicious Paris. Susanne - a slave to shopping, she can't escape the high demands of her 24/7 job and absent love life. Justine - Helicopter Mom to the core, she wants to escape her empty nest and distant husband. Ruth - a Parisian native, she has returned with a dark secret and bitter feelings toward her own country. Mia - in love with Paris, she does her level best to dig deep into her clients' psyche to deliver a meaningful week long adventure. Her mantra -- THERE'S NO SUCH THING AS TOO MUCH PARIS. Chart the course of these divergent women as they explore the wonders of Paris. Taste it, feel it, love it. The Paris Effect will transport you. Note from author: The fictionalized character of Ruth is based, in part, on the experiences of the author's mother during WWII. THIS IS HOW TO START YOUR DAY IN PARIS! 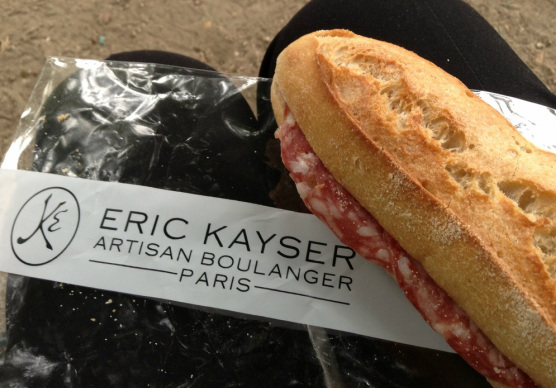 Eric Kayser brings a smile to my face. His boulangerie kingdom has no match. Whether it's a baguette Monge, a pain au chocolat or a salami sandwich, you can't go wrong if you wander into one of his shops. It's true, there's much more to Paris than what fills your tummy, but without question, you need to charge your battery so you're ready to inhale the pleasures of PARIS. My blog will explore food, architecture, books, movies and all the reasons you find Paris so tempting. For more photos and articles like this, please see blog tab near top of page. Thanks for visiting www.thepariseffect.net! One of the joys of dining in Paris is the ease of eating alone. It's true, the most romantic city in the world offers the single diner the option of wining and dining alone. The photo here was taken at the marvelous A la Biche au Bois, where I sat alone one weekday afternoon enjoying a solitary lunch, surrounded by locals imbibing in their work-a-day lunch. The remarkable cheese plate at the table next to me drew wolf whistles and much admiration from its "renters" and a bit of drooling on my part. They grinned at me in delight, thrilled by my request to snap a picture of their yummy platter. Some of my favorite Parisian restaurants to enjoy solo dining: A la Biche au Bois, Le Rallye Peret, C'est Mon Plaisir, Cuisine de Bar, Bouillon Chartier, Les Cocottes, just to name a few. One time I burst into a fancier-than-expected restaurant right at noon (La Table d'Eugene) and in spite of their probable horror at seeing a single diner (petite dining room, limited seating), they treated me like a princess. Sometimes I want to be quiet. I sit and enjoy the room, the other diners, the food on my plate. It can be as restful as you desire. Or, if you desire a bit of conversation, don’t be shy. Smile at your “next door neighbor” and you might be welcomed into their conversation. I’ve met a number of people who have broadened my experience in very interesting ways. Some of these chance conversations have turned into long-distance friendships to treasure for a lifetime. 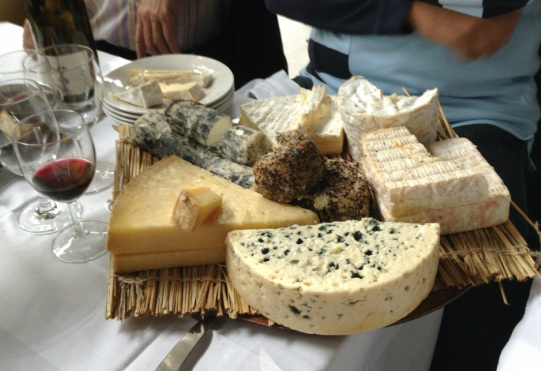 So, the next time you dine alone in Paris -- savor the moment, the food, the wine, the people. Bon appetit! DO WE REALLY NEED ANOTHER BLOG ABOUT PARIS? I grew up in a small town in Illinois (Kewanee -- Go Boilermakers!) with an appreciation of all things Paris. When I was just 11, my parents sent me (kicking and screaming) on a solo trip to Paris for the entire summer vacation between 5th and 6th grade. I had never before met my Aunt Ginette, Uncle Robert or cousin Florence but they embraced their little American and gave me my first taste of la vie francaise. 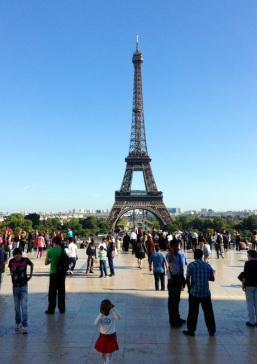 My memories of that sweet summer started a lifetime of pursuing, plotting and stealing the means to get back to Paris. Lucky to be married to a fellow travel nut, my husband Gary and I have made countless trips to France and beyond. We've had the good fortune to include our daughter Sara from time to time as well as sister Jackie, brother Eric and their spectacular families. Travel is not easy. Planning is essential. But, mapping out a basic itinerary is half the fun of the trip. I start planning my next journey the minute I take the dirty laundry out of my suitcase. You don't have to be a millionaire to have a good time in Europe, not even when you're planning a trip to one of its most expensive cities. - Don't break the bank. Assume it's not going to be your one and only trip of a lifetime. - Read Rick Steves Guidebooks from cover to cover so you learn how to bank, what to pack and how to avoid long museum lines. Read blogs, articles, books. Watch movies. DREAM. - Remember, just like Mia, you can't please everyone all the time so make sure to please yourself and smile a lot. An open mind is the key to getting the most out of your trip. If you like to walk and your mate doesn't, deposit him in a café or sports bar while you take a hike. If he insists being chained at the hip the entire trip and brings you down, leave him at home next time. If your best friend decides to stay out too late and gets drunk every night, get some shut eye so you can start out bright and early the next morning without her. Travel is a compromise but if you expect to have fun, you will. PUSH BACK! Final words: Laugh, eat too much, talk to people. Note: if you enjoyed this post, please go to the top of this page and check out the tab that says BLOG. I update the BLOG page often, covering all things Paris -- museums, restaurants, books, cinema, parks and more. Thanks for visiting www.thepariseffect.net. Please come back soon.